When Philadelphia narcotics detective Doyle Carrick loses his mother and step-father within weeks of each other, he gains a twenty-day suspension for unprofessional behavior and instructions to lay low at the unfamiliar house he's inherited in rural Pennsylvania. Feeling restless and out of place, Doyle is surprised to find himself falling for his new neighbor, Nola Watkins, who's under pressure to sell her organic farm to a large and mysterious development company. He's more surprised to see high-powered drug dealers driving the small-town roads dealers his bosses don't want to hear about. But when the drug bust Doyle's been pushing for goes bad and the threats against Nola turn violent, Doyle begins to discover that what's growing in the farmland around Philadelphia is much deadlier than anything he could have imagined . . .
Quick, clever, and terrifying, Jon McGoran's "Drift" is a commercial thriller in the tradition of Nelson DeMille's "Plum Island. JON McGORAN has written about food and sustainability for twenty years, as communication director at Weavers Way Co-op in Philadelphia, and now as editor at Grid magazine. During that time he has also been an advocate for urban agriculture, cooperative development and labeling of genetically engineered foods. He is a founding member of the Philadelphia Liars Club, a group of published authors dedicated to promotion, networking, and service work. In Drift, he combines his interest in the increasingly bizarre world of food today with his love of the thriller. 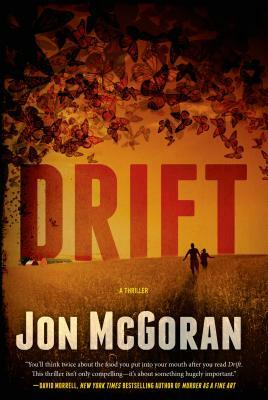 "Jon McGoran's wry narrative is on full display in Drift, a fun tale that follows the exploits of suspended detective Doyle Carrick, who learns the hard way not to stick his nose in his neighbors' business." "Gripping, chilling and written with aplomb. Packed with plot twists and palpable tension; it's Lee Child's Killing Floor with a smart-aleck Reacher. Genuinely unputdownable."